The phenomenon The Stroop Effect first discovered by American psychologist John Ridley Stroop is where the brains reaction time slows down when processing conflicting information. This happens because of interference or the use of incompatible functions in the brain causing the decreased reaction time within the brain. This phenomenon is usually studied with a stroop test where a researcher first takes note of how long a participant takes to say the name of a colour printed in black or grey ink. For example if they see the word ''yellow'' printed in either black or grey ink then they would say ''yellow''. Then secondly the researcher takes note of how long it takes the participant to say the name of another name of a colour but this time it would be printed in another colour that's not consistent with the word itself. For example if the word is green and it is printed in orange then they would have to say ''green'' and not what colour it is printed in. Usually the second part of this test is much trickier and many people makes mistakes because they are presented with conflicting information. - Brain activity to see what areas of the brain are functioning in respects to focus and attention. Another variant of the Stroop test is where a researcher may show a participant a card with a negative word such as sad, hurt or unlucky mixed in with other neutral words such look, press or write. Again the words are coloured and the researcher takes note of if the participant says the negative words faster or slower than the neutral words. It has been shown that depressed participants are more likely to say the colour of a negative word slower than they would if it was a neutral word. This produces the same effect much like the original Stroop effect where the words again are the names of colours and are presented in an unusual way printed in mismatching colours. The participants are asked to name the colour of the word presented but because the words are printed in an unusual way and are incongruent with the colours they are typed in this slows down the brains reaction and processing time making it difficult to complete the task as easily and straight forward as they normally would. 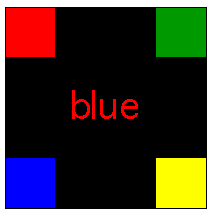 Again similar to the original Stroop test but the participant is presented with a black square with the name of a colour printed in the middle but it is printed with in a colour inconsistent with the printed word, for example the word blue will be printed in red. The black square will have four smaller squares in each corner and each of the smaller squares would be a different colour. The researchers would ask the participants to point to one of the smaller squares that is the same colour as the printed word in the middle, for example they would point at the red box because the word printed is in red but unsurprisingly enough participant do actually get this wrong. The effects of this test is very similar if not the same as the original Stroop test causing slower reaction and processing time. Thanks so much you have one of the best explanations of The Stroop effect online. I would disagree with how the warped Stroop effect is explained here. In normal Stroop tasks, the incongruent trials are slowed down because of the inherent reaction to read the word printed, rather than simply stating the color. If the words are warped and therefore harder to read, it would be much easier to ignore this reading response, and instead respond simply to the color. This should actually speed up the process because your brain is not focused on reading the word. Hello, I would like to use this information for my essay. Can I please have a reference? ?